TechnoKids’ newest release is TechnoCode, a technology project that introduces coding with Scratch to elementary and middle school students. It is an ideal project for Grades 4 and up. Jam-packed with programming activities, TechnoCode sparks an interest in computer science. Step by step instructions explain how to build animations, stories, games, art, music, and simulations. Empower students with real-world skills they can use in the workplace. The instructional materials in TechnoCode encourage students to think like programmers. Resources include sample videos to inspire imaginations, planning sheets with guiding questions to help design scripts, assessment tools to evaluate student work, and coding journal logs to reflect upon learning. Coding Unit with Elementary Students: Assignments in Sessions 1-3 in TechnoCode are ideal for students new to Scratch. The activities are perfect for Grades 4 and up. Students design animations, create art, develop games, and compose music. The emphasis is on coding basics including how to build scripts, sequence commands, control action with if then conditions, and create simple loops. The activities focus upon directing movement, synchronizing sound, and understanding x and y coordinates. Coding Unit with Middle School Students: Once students understand the fundamentals of coding in Sessions 1-3, they extend their learning in Sessions 4-6. The activities are ideal for students that understand the fundamentals and are ready for a challenge. The critical and computational thinking required is ideal for students in Grades 6-8. They produce a story, engineer a game, develop a treasure hunt, build a diorama, and remix a project. The emphasis is on having students manipulate the appearance of sprites, direct the timing of events with broadcasting, and create original artifacts using conditions, variables, and operators. Build games using Scratch. Learn how to use variables to track the score. Computer Science Course: TechnoCode has 25 assignments designed to ignite an interest in computer science. The focus is on thinking like a programmer. Each coding activity is divided into four parts – exploration, practice, freestyle, and reflection. Using a question and answer format, students discover the function of command blocks. Next, they follow guided instructions to build scripts. Afterwards, they apply their skills to complete open-ended challenges. Once a Scratch project is finished, students write a coding journal entry to reflect upon the experience. Hour of Code: If you only have one class to teach coding there are many assignments in TechnoCode that can be used for this purpose. If your students are beginners, they can develop simple animations. Assignment 5 targets how to build a script, Assignment 6 explores directing movement, and Assignment 14 focuses upon changing the appearance of a sprite. If your students have existing knowledge of Scratch, the skill reviews in Sessions 2-5 are excellent challenges. Coding Workshop Series: If you are running a workshop series as part of an after-school program or community event, then you will need to select assignments that fit the number of classes offered. As well, consider the age range and coding abilities of students. 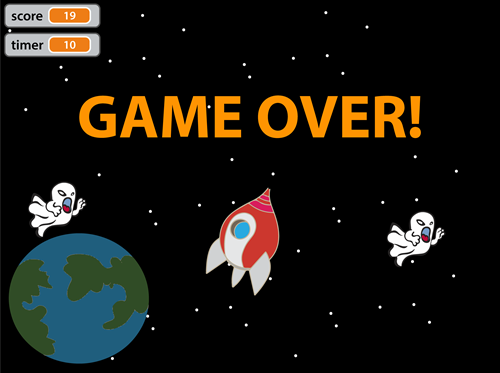 Coding with Scratch is highly addictive and fun! Your students will develop a host of essential technology skills as they create unique games, interactive stories, animations, and more! NOTE: The technology project, TechnoJourney was replaced with TechnoInternet. The activities are similar. TechnoJourney internet activities have been recently revised, with new and improved lessons for elementary and middle school grades. The Internet is constantly changing and so are TechnoKids projects! TechnoJourney is a fun introduction to the Internet and it has just been completely updated. Have your students become Internet savvy with TechnoKids authentic online experiences. Teachers, do your technology curriculum objectives include any of the following? TechnoJourney teaches these concepts and more with fun, engaging activities. Students travel the Internet with a passport in hand. Choose a destination: Visitor’s Center, e-Library, e-Media Center, e-Playground, e-Mail Depot, or e-Cafe. At each stop students explore the sites, complete activities, and receive a stamp in their passport. This online expedition allows students to discover the wonders online as they learn the importance of responsible digital citizenship. When you order TechnoJourney you receive a teacher guide, digital student worksheets, and customizable resources. Additional materials such as an Internet map, Internet passport, Internet citizenship card, assessment tools, and enrichment activities support learning. 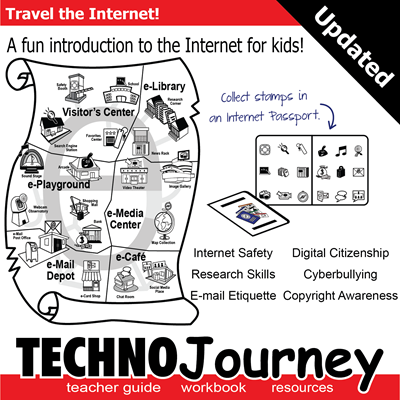 Transform your students into Internet experts with TechnoJourney internet activities!